hackerspaces | flux – Page 2 – Redefining hackerspace culture, one post at a time. One of the buzzwords doing the rounds in the past few years is ‘personal fabrication’. The idea that in the foreseeable future we all will be able to fabricate our own stuff. And although the founder of the fablab phenomenon, MIT professor Neil Gershenfeld, is pretty nuanced about it (watch his TED talk on the subject), some are actually talking about upsetting the traditional supply chains for manufactured goods. It actually is one of the stated goals of the Global Village Construction Set project by Open Source Ecology. The heavily ajective-laden newspeak of their website, this is actually a cool project. Watch Marcin Jakubowski’s TED talk about it. Also read Far McKon’s rather thoughtful criticism of it on his blog. The snark in me prevents me from omitting that the Open Source Ecology are doing everything in imperial measurements. Which aren’t quite useful for your stated target audience: farmers and villagers in the developing world. Get with the program guys, use metric! Other than that, I find any ideas on reducing our interdependencies a bit interesting. There are a few snags here and there. First of all, economies of scale matter. They matter a great deal. Actually, a lot of the activity in hackerspaces would be impossible weren’t it for the fact that China has become our global workshop. There is no way other than massive robot usage in which we can ever dream to meet the current price-performance ratio of the Chinese manufacturing base. Also, do not forget that current shipping all over the globe is probably one of the last things to survive through the permanent oil crisis we have just entered. Simply because the energy expended lugging that container full of stepper motors for your repraps from Shanghai to Rotterdam or San Diego is actually pretty low. A shame that those massive container behemoths burn really dirty oil for that. Not even the next leg, either inland shipping over the river Rhine or over rail from San Diego elsewhere in the USA (granted, electrifying US rail networks would be a big win and will be inevitable). It is the last hundred or so kilometers that are the really energy-intensive part of those steppers’ journey. Personal fabrication only makes sense for niche products such as spare parts and when access to the world’s supply chains is not really affordable. Which indeed means the developing world, but perhaps also rural communities in a not so distant future in which the world has stopped shrinking and has expanded again because oil is not so cheap anymore. All of this does not mean that the GVCS is not an incredibly interesting idea that doesn’t deserve support. It also doesn’t mean distract one jota from the fact that affordable CNC-machines and additive manufacturing will make craftmanship accessible again, without the five years minimum you have to spend to get a skillset need for say, advanced woodworking. In the past lots of us had great ideas that would require the collaboration of several disciplines and therefore execution would be difficult. Now that lasercutters,CNC-mills and 3D-printers are within reach of hobbyists and hackerspaces, these barriers are crumbling. Atoms may or may not become bits, but lasercutters are cool! This weekend the 18th and 19th of February will be the second Global Hackerspace Cupcake Challenge. 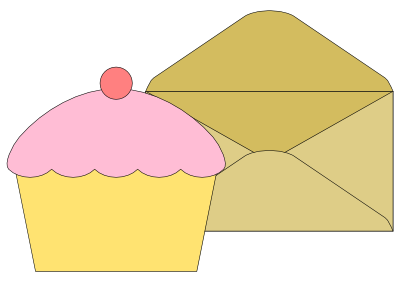 Hackerspaces worldwide are challenged to bake, decorate and package a single cupcake and send it to another hackerspace. The receiving hackerspace will then open and judge on various topics including decoration, condition and taste. Full details are included on the Global Hackerspace Cupcake Challenge 2012 wiki page. Below you can see last years winner denhac from Denver, US which was recieved and judged by NESIT Connecticut, US. It’s time to look back and look forward. If you’re anywhere near Berlin in February, you should join us. Please put Friday, February 3rd 2012 in your agenda. We reserved a slot for a symposium and get-together at the c-base Hackerspace in Berlin. It will be an official partner event of transmediale.12. transmediale is an annual festival for media art and digital culture taking place for one week in February in Berlin, Germany. Gathering protagonists from the DIY hacker movement who build spaces for people to make and build things, we will explore a phenomenon that exploded in 2007 and has been growing ever since. Be prepared for in-depth discussions on blinking electronics, tinkering, self-organization, spaces, hacking in places like Africa, Asia, America, or Europe, and a friendly outlook on things to come. The Occupy Movement is an international protest movement which is primarily directed against social and economic inequality. Currently there are hundreds of groups around the world Occupying Together. Noisebridge, a hackerspace in San Francisco, as always is open to those looking for a space to work on projects, and resources to make those projects a reality. We’ve been seeing more and more groups coming through seeking aid for things related to the Occupancy. Together we’ve built out interesting ways to recharge car and cell phone batteries, provided internet at camp, had meetings about web presence, document GA minutes and more. We want to let the participants of the Occupy Movement know that we’re here and open to them. We’ve also started a site called hackupy.org (graciously hosted off of Hackerspaces, thanks!). Hackupy are open hack nights at hackerspaces for Occupy related projects, and the site gives a listing of spaces which provide such nights. So far hackupy has been happening at NYC: Resistor and almost 24/7 at Noisebridge, and we look forward to seeing more hackerspaces jump in and provide time to those wanting to hack for excellence! I know this has been done to some extent before, but we’re having another go of it. Better faster stronger and all that. SpaceCamps exist as a venue for facilitators and founders of hacker and maker spaces to speak to each other on the meta level of the maker movement and the associated responsibilities. 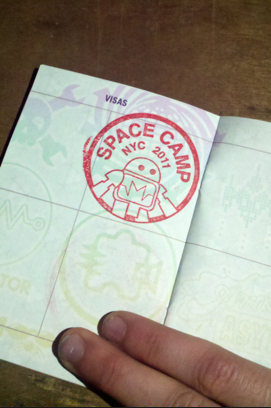 SpaceCamp has taken place at Maker Faire San Mateo, Detroit, and New York. It’s also taken place for the Seattle ecosystem and informally at Chaos Communication Camp in Germany. This first global Camp will bring together people from all over the world (ok, mostly North America until our budget is better) for a focused 2-day event. We will all learn from each other’s victories and mistakes, design new patterns for our space processes, and walk away from the event with deeper ways to interact with each other. Let’s get together and have dedicated time to learn from each other. Come prepared to present, as this will be an unconference format. We’re working on getting funding for travel scholarships, and we’ll all throw in together to cover food and drink. Tracks fall into the general categories listed above, and might include things like “If you could go back in time, what lessons would you impart to yourself (and how would you get you to listen? )” “Pokelhaftigkeil (the slump in energy after formation)” “Succession Planning” and “avoiding recreating hierarchical systems when trading time for dues” (add more ideas to the Atrium blog – please tag appropriately and comment a +1 on ideas you like). We’ll be capping attendance at around 350. The offered space must be able to comfortably and safely house the 200-400 expected attendees. The event will take place from early Friday evening to late Sunday evening some weekend in April or May. 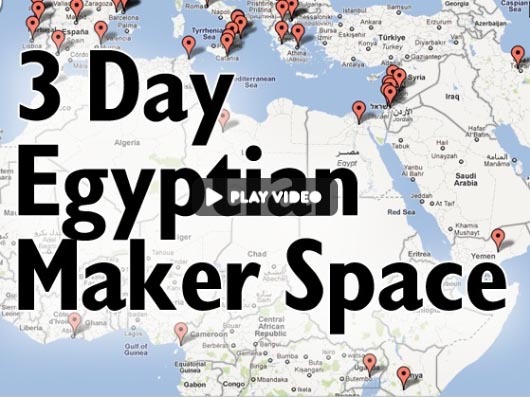 Maker Faire Africa is coming up next month, in Cairo, Egypt. It promises to be a three-day mashup of Africa’s most imaginative makers. And, at least two Americans will be joining them. Bilal Ghalib (co-founder of All Hands Active hackerspace in Ann Arbor, MI, and hackerspace documentarian) and Mitch Altman (co-founder of Noisebridge hackerspace in San Francisco, CA, inventor of TV-B-Gone remote controls, and recent recipient of the first-ever Maker Hero Award) are going to Maker Faire Africa to create a three-day hackerspace there. This will help the founders of the Cairo Hackerspace establish their forming space into a physical reality which, in turn, will help get other hackerspaces going throughout Africa. We have recently seen how important hackerspaces are in helping people in Africa live more fulfilling lives. Let’s see how much more we all can do with so little! 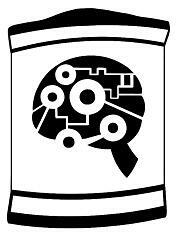 Introducing a project brought to you by the The Brain Tank, DC401, and Hackers like you, called “HackerHostel.com”. *NOTE: This is an excellent opportunity to use your new Hackerspace Passport. Negate one of the larger expenses associated with travel, namely HOTEL FEES, in order to further promote idea cross-pollination through visitor, ambassador, and Hacker In Residency programs for Hackerspaces. 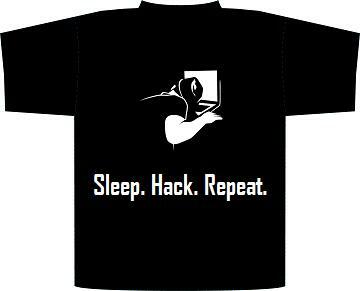 A website that will allow users to view Hackerspaces with available sleeping quarters and to submit visitor proposals to participating Hackerspaces for review. Tell us about yourself and what you wish to teach during your stay at your Hackerspace of choice. The website will help Hackerspaces manage their proposals, discuss Best Practices, as well as help raise money for spaces to spruce up their sleeping quarters if necessary. Also, each Hackerspace would have some kind of profile detailing the space available, the kinds of classes they might be looking for, what tools facilities would be available to the HIR. What better way to spend a short vacation than to learn something and teach others something new? We can further innovation and the exchange of ideas over the course of a few days by removing those pesky physical borders. Whatever you consider a comfortable place to stay for a brief period of time in your Hackerspace. Could be a hammock, place to put a sleeping bag, a couch, or actual bunk bed. If you’ve got a space to crash, you’ve got a Hacker Hostel. The amount of time you allow a Hacker in Residence to stay is entirely up to you. We’ve begun setting up The Brain Tank in Providence RI as a testing ground already. We should be able to comfortably sleep 2 HIR’s (Hacker in Residence) on proper bunk beds. A volunteer will be living and innovating 24/7 at The Brain Tank helping us work out the bugs and blogging about their experience. It’s a really convenient and safe area to live in. -The website domain name www.HackerHostel.com was graciously donated to us. Thank you very much, we couldn’t have done this without your generosity. *If anyone at all wants to be part of this website build please contact me ag3nt5@dc401.org , we could really use the help. Note: This project is soooo simple to put together and would have a significant benefit to Hacker Culture. Right now all I think it really needs is a VIDEO, a WEBSITE, and a properly formed statement/description. We’d be helping to break down the barriers associated with the inconvenience and expense of travel. Making it easier for great minds and talents to move around freely teaching each other what they know. Yes, there’s quite a bit to figure out. Each Hackerspace is different and TRUST is a huge part of the success of this project. Having guests stay at your place is a very personal thing. But if complete strangers on CouchSurfing.com can do it, I think the Hackerspace Community will have even better success as we are in fact a strong Community. If you have any ideas, questions, or would like to help in any way, please contact me and we’ll get the ball rolling. In December of 2008, a group of hackers was sitting on the floor with faces aglow with laptop light cruising the internet and skyping friends in and listening to death metal. B: There should be a book. B: We have 12 days. A: We can do it. The twelve days we had was until CCC started. We figured we would have it done by then. We contacted all the hackers we knew around the world and put the word out. We expected to get about a half a page of writing from each space. We reckoned that it would be a 25 page pamphlet. We also reckoned that it be easy for folks to write up a little summary within a few days of what it was like to get their hackerspace started and get back to us. Within a week we had been scorched by a flame war, gotten a lot of both written and photographic material submitted and it seemed likely that the book would happen. Then the submissions kept coming… and coming. The hackerspaces around the world told each other about the project and many groups sent some writing in describing the beginning of their hackerspace. Word had even gotten round to groups that didn’t have a space yet and they were sending us descriptions of their pre-beginnings too! The 12 days came and went and still the submissions kept coming. After a few months submissions had trailed off and Astera came to NYC and began designing the book. She’s a pro and it shows. This book looks beautiful because she took the material and somehow made it fit together aesthetically, not a trivial task. Jens Ohlig jumped into the process last year to help push the editing process forward. Remember, in our minds it was going to be a project that would take less than two weeks and it turned into something epic. It’s been a long wait and I hope you’ll think that it’s worth it. 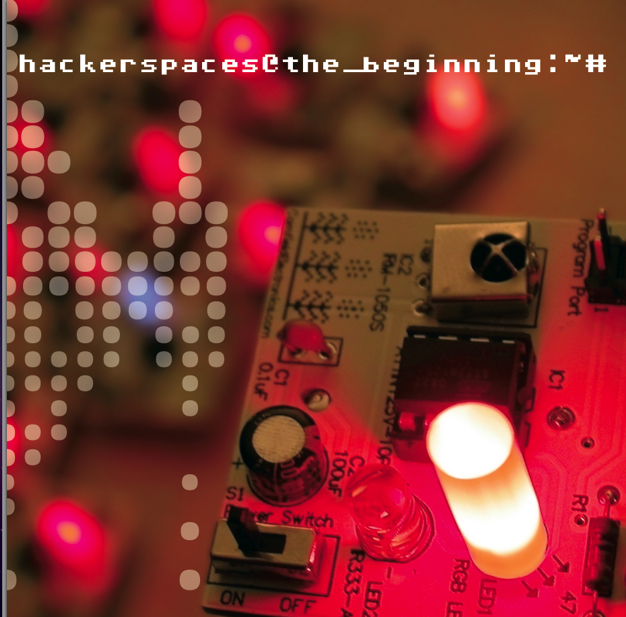 This book documents where the hackerspace movement was in December of 2008. In that way it’s a bit of a time capsule. It’s not an exhaustive book, but we hope there are enough stories in here to show that all your excuses for not starting up a hackerspace are invalid. Each group faced down their own dragons to bring their hackerspace into existence including floods, rats, and drama. If they can do it, so can you. We did this because we wanted it to exist and so it is a reward in itself. If you feel moved and want to support hackerspaces, we suggest contributing to the Wau Holland fund which helps make awesome things happen for hackerspaces. We would also like to thank everyone who submitted photographs and writing, this is your book. After these years, the book is finally free in the world as a pdf. Download it, read it, and share it. We’re open to the idea of making it into a real physical book and if you’re interested in making that happen, let us know. The world lost another hero…. Today the news came quite late to me, Len Sassaman lost his life. I was shocked, I have met Len and Meredith about 6 months ago, they where visiting Utrecht for a crypto (of-course) meetup. Between the meets they had some time to visit the local hackerspace and have some breakfast. I remembered our conversations as intense and awesome. Len inspired me to go on with projects which seem to be endless or almost impossible. I don’t think I’m lying if I say Len was this for a lot of hackers: somebody who was different and a source of inspiration. Although I wasn’t in contact very much with Len lately, I have chosen to write this blog and let people know what a great guy he was, please feel free to use the comment field as a condolence register. All the best to Len’s wife, family, friends and everybody else who knew Len. For those who would like to say goodbye to Len, Saturday 9th of July 12:00 (noon) at “De Jacht cemetery in Heverlee” in Belgium there will be the ceremony. Meredith is inviting everybody who would like to come.